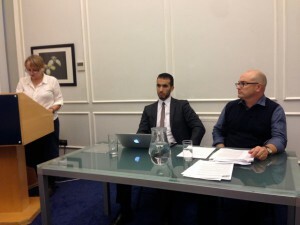 In the week that the government announced new counter-extremism measures, the IRR publishes contributions from its seminar on ‘Securitisation, Schools and Preventing Extremism’, held at Garden Court Chambers on 7 October, where participants considered the consequences of a new statutory duty on public bodies to prevent non-violent extremism and whether it breached the Equality Act. This week, the home secretary Theresa May unveiled a string of new anti-extremism measures. Already, Sir Peter Fahy, national policing lead on Prevent and counter-radicalisation, has questioned the wisdom of the government’s approach, warning that the measures are possibly counter-productive and a period of consultation and debate is needed. In addition, teachers are concerned that new statutory duties, that came into force in July 2015 and places them under a duty to take measures to prevent non-violent extremism, may breach the Equality Act 2010, which stipulates that direct and indirect unlawful discrimination is taken seriously, and that individuals or groups should not be treated unfairly or put at a disadvantage. On 7 October, teachers, parents, university staff and representatives of international human rights organisations came together at a seminar organised by the Institute of Race Relations and the Collective Against Islamophobia in France. Participants voiced concerns that the duty, which has already led to a number of disturbing cases where predominantly Muslim children have been treated in a heavy-handed and discriminatory way, could involve violations of Articles 2, 3 and 13 of the United Nations Convention on the Rights of the Child. We publish today the contribution given at that seminar by Bill Bolloten, a leading educational consultant who specialises in issues of equality and diversity. He believes that the new statutory duty is not only misguided and counter-productive, but confuses the professional roles of police and teachers. ‘The new duty risks closing down the very opportunities where the classroom can be used to develop an inclusive curriculum that fosters democratic skills and explores human rights’, he says. Yasser Louati is director of the CCIF, an organisation that assists the victims of discrimination in France. His contribution, also published today, concentrates on the many cases taken up by the CCIF, including those of 130 young Muslim students expelled from school for wearing a long skirt and that of a French teacher reported to the school board by his own pupils. Yasser Louati warned the British authorities not to follow the French Ministry of Education’s lead by institutionalising an anti-radicalisation schools programme which is ideologically driven and linked to debates on national identity. Liz Fekete can be contacted on 020 7837 0041 or liz@irr.org.uk. Yasser Louati can be contacted on +336 95 54 58 14 or ylouati@islamophobia.net and Bill Bolloten can be contacted on 07790 031189 or billboll1@mac.com.